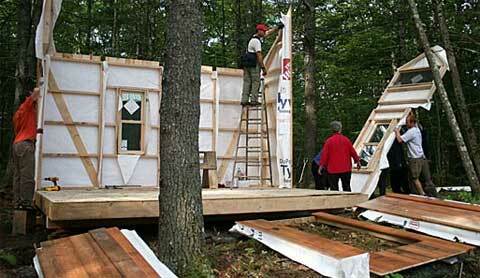 The Bungalow In A Box is a very flexible and adaptable, prefabricated Panel-Frame structure. I simply love their designs; they’re full of character yet very quick to assemble (1-2 days) with minimal impact on the neighbors and the site. Perfect for prefab cottage-camps, garages, home offices and studios, the Bungalow In A Box is based on SIP panel walls, timber frame ceiling elements, and interlocking natural, sealed wood sheathing in combination with air barrier house wrap. 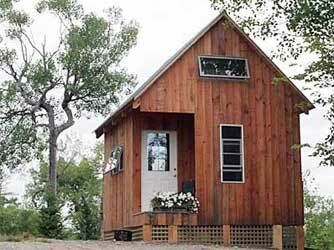 A basic 12’x16′ prefab bungalow is estimated at $13,700. I will be living behind my daughter’s home when she buys one. We are not ready yet. I am wondering if you could make all door’s at 36″. I’m in a wheelchair and need extra clearance. The only room to be closed is the bathroom. Do you do the interior as well as the outside?. If I buy a dome that is prefab can you install as you build? Is there a laundry area in the little houses? How much is all this? 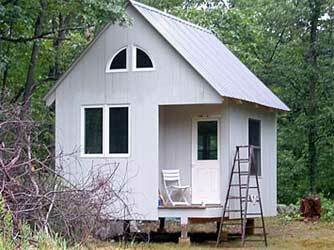 I am a widow and looking for a one bedroom small pre-fab small home. I love the ones one your website. Do the have like a little bathroom or kitchen area? I live with my daughter but would like a little place of my own. Thanks. Josie.